PS: Don't forget to enter our giveaway for easy menu plans! I have been wanting to discover how to make my life in the kitchen easier for a long time now. I've been researching freezer cooking and once a month cooking but I have to say I've been a bit intimidated by the process. 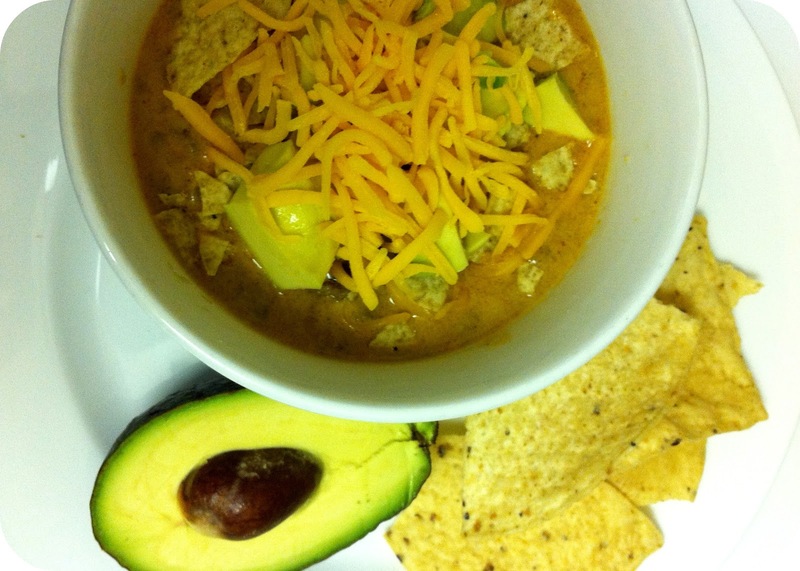 Enter Michelle from Make 5 Dinners in One Hour. She has an easy weekly plan where you spend one hour in the kitchen preparing for five nights of meals. I received a months worth of meals broken down into 4 weekly menu plans. Each week contained two sheets. The first was a detailed grocery list broken down into categories like dairy, canned, and produce. This made it easy to check my pantry for what I may have already had on hand and cross it off my list. It also made shopping easy...no need to create a new list! I just took that list right into the store with me. She also includes tips and tricks on here. The other sheet contained the menus. It is broken into 3 easy to follow columns: Menu, Ingredients, Assembly Directions. I went through all 4 weeks of menus and chose the one that I thought my family of picky eaters would most like. It included recipes such as Cheesy Ham and Potato Casserole, Slow Cooked Tortellini Stew, and Shrimp Roll Ups. When I was ready to begin I followed her list of kitchen tools and pulled out everything I would need. I layed out all of the ingredients and began following the assembly directions. One hour and 15 minutes later (yes, it took me a tad longer than an hour BUT I'm slow in the kitchen) I had 5 meals in the fridge and ready to go for the week ahead. Each day all I needed to do is pull out the prepared ingredients and follow the cooking instructions. She pairs each meal with simple side dishes like a bagged salad or frozen veggies to make completing the meal a cinch! What I really liked about her menus is that she marks which ones are good for freezing. If you are ambitious you could make 2 weeks worth of meals. Pop the ones that are marked freezable in the freezer and keep out the ones that are best fresh. In just 2 hours of prep time you'd be set for the next 2 weeks! Michelle is currently offering her menu planning service for $15 for 3 months of menus, which is only $1.25 per week. What you get is weekly menus complete with a grocery list, assembly instructions and heating instructions. 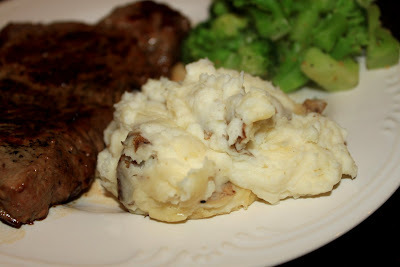 You can contact her over at her blog AND you can enter to win a month of menus here! 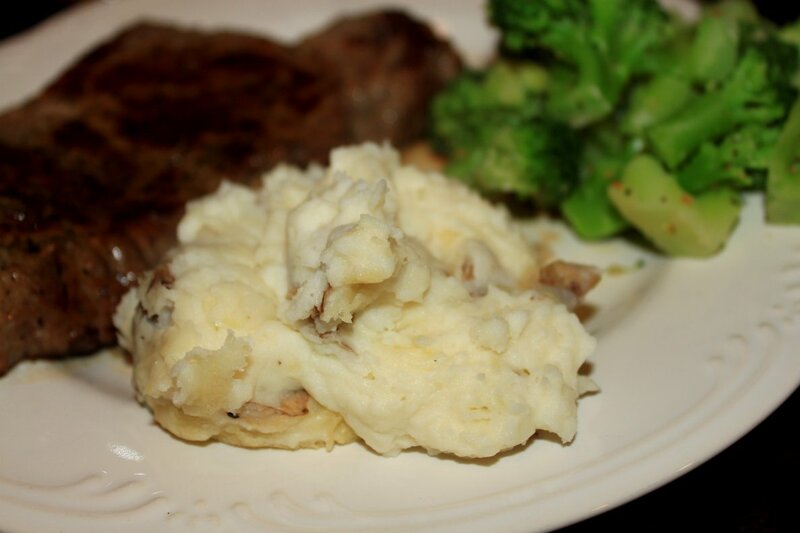 She is offering two of our readers 1 free month of her menu service. Entering is easy! Just leave us a comment and tell us your favorite trick for saving time in the kitchen. Please be sure to leave an email address for easy contact. Want a few additional entries? Leave a comment for each entry. Grab our Button! Be sure to leave a link so we can see it on your site. Congrautlations to Mippy and Angelene! Winners have been contacted via email. Remember when I shared my love of antique shopping? 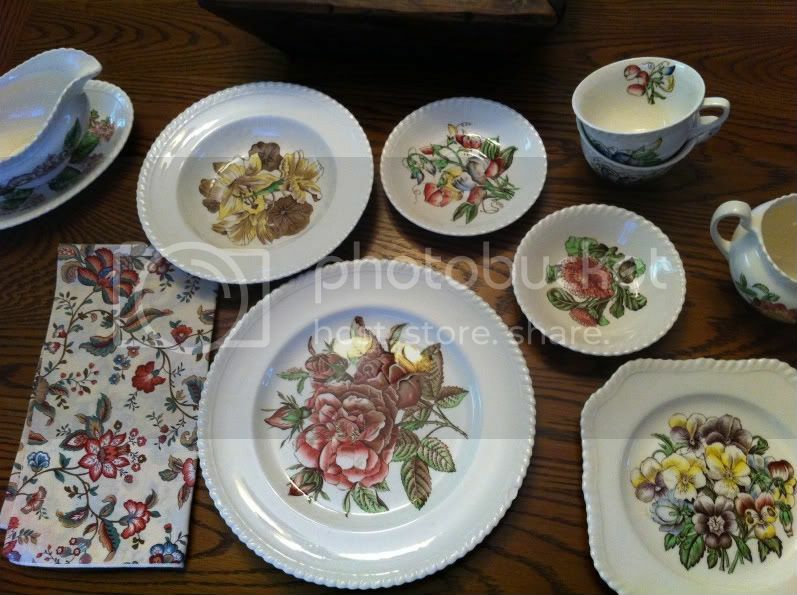 I really really wanted to buy this beautiful set of antique dishes from a local antique store but couldn't stand to spend the $200.00 on them. I was one of the winners of the Frosted Mini Wheat's School Years Resolutions!! I won $250.00! Combined it with my saved up change and it was enough to buy the dishes, a great center piece for my dining room table and even the kids Halloween costumes!! 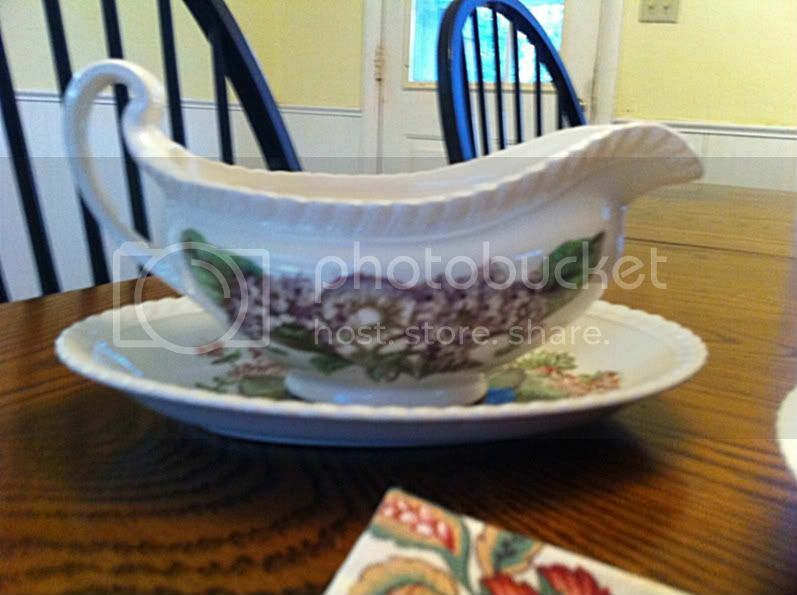 I Now Own a Gravy Boat...lol - who cares if I don't even really like gravy! I can't wait to serve my Thanksgiving Dinner on my new dishes! I think they are going to make my 2nd year of cooking a great success - now...to figure out how to carve a turkey so that we all actually get to have some and have leftovers. Do you enter sweepstakes? Have you ever won? A few months back I scored a subscription to Redbook magazine for $5 on Amazon.com. It has paid for itself in spades because I've gotten some yummy recipes from it such as this one that I bring to you today. My husband devoured his and finished off the ones 2 of my kids wouldn't eat. My oldest loved it and 2 days later even asked me when I could make them again. I LOVE hearing things like that from my kids about things that I make! I had left over stuffing mix and my husband took that to work for lunch. Boy, I sure got mileage out of this recipe! 3. In a large bowl, toss rice, sausage, scallions, oregano, marinara sauce and mozzarella sauce. 4. Fill pepper cavities with mixture. 5. Cover peppers with foil and bake 20 minutes until peppers are tender. 6. Serve with extra marinara sauce. I love to bring something with me when visiting for the Holiday's but with 4 kids I don't always have the time to make elaborate dishes. I'm lucky if we all make it there dressed and on time. So when I saw this recipe in Every Day with Rachael Ray - I knew that it would be a great for holiday gift giving...takes only 5 minutes to throw together and while it sets up I can get ready to go. 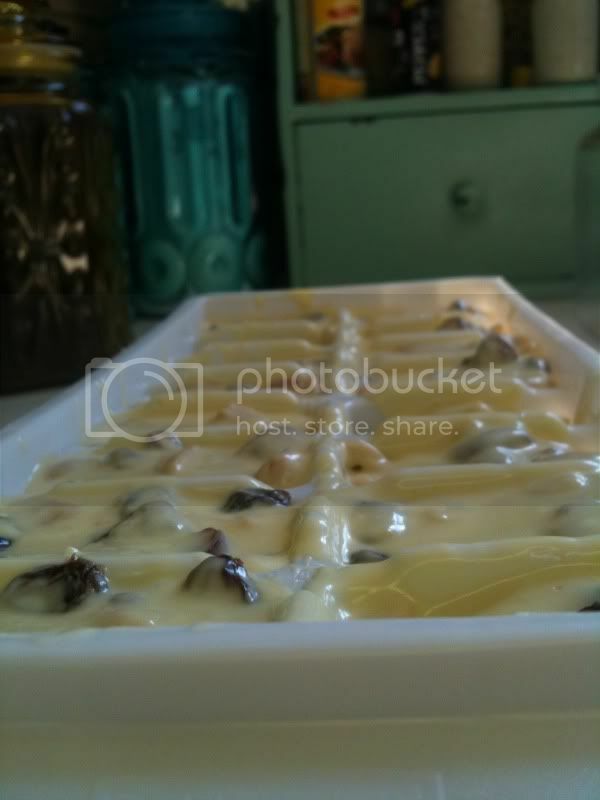 I love that the magazine talks about using ice cube trays as candy molds - it worked beautifully! They came out mostly uniform and really easily! In a medium, microwaveable bowl melt chocolate, stirring once, for about 45 seconds. 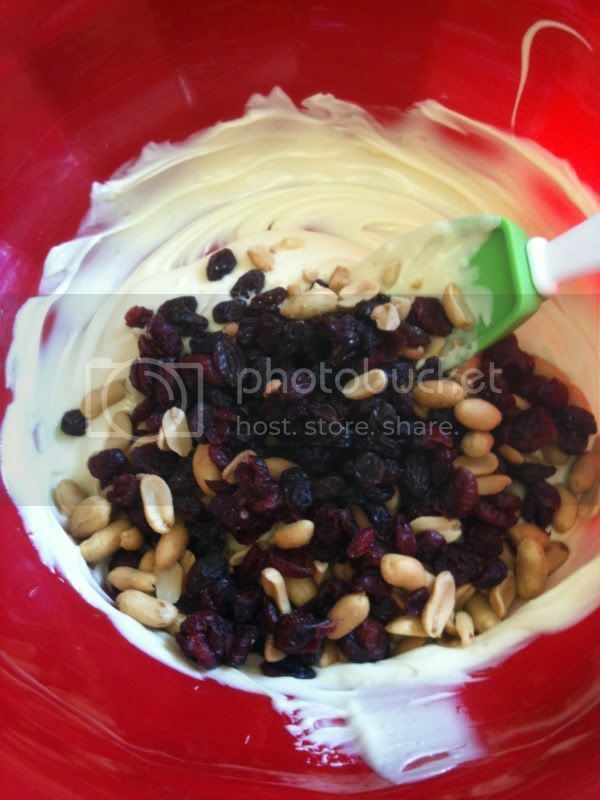 Stir in the raisins, cranberries and nuts. 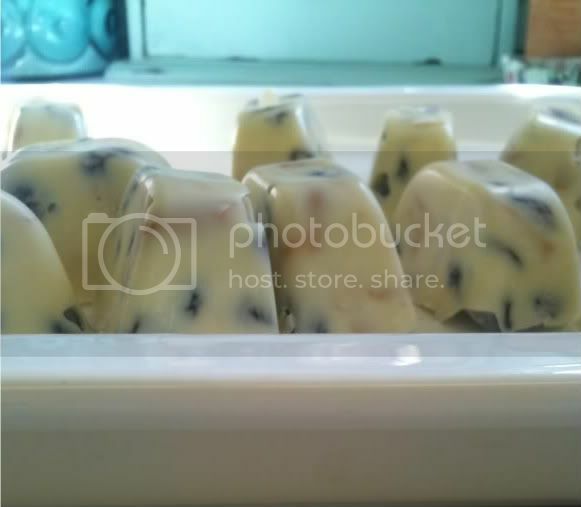 Spoon mixture into 2 flexible ice cube trays, whacking the trays on the counter to remove any air pockets and to level out the mixture. 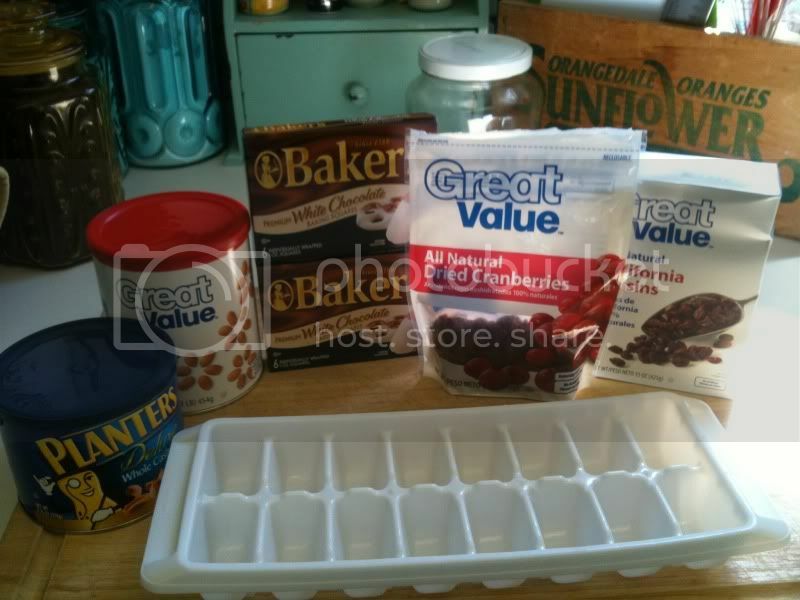 Flex trays to remove candies. Bask in the glow of bringing some really yummy candies. Hi, there! 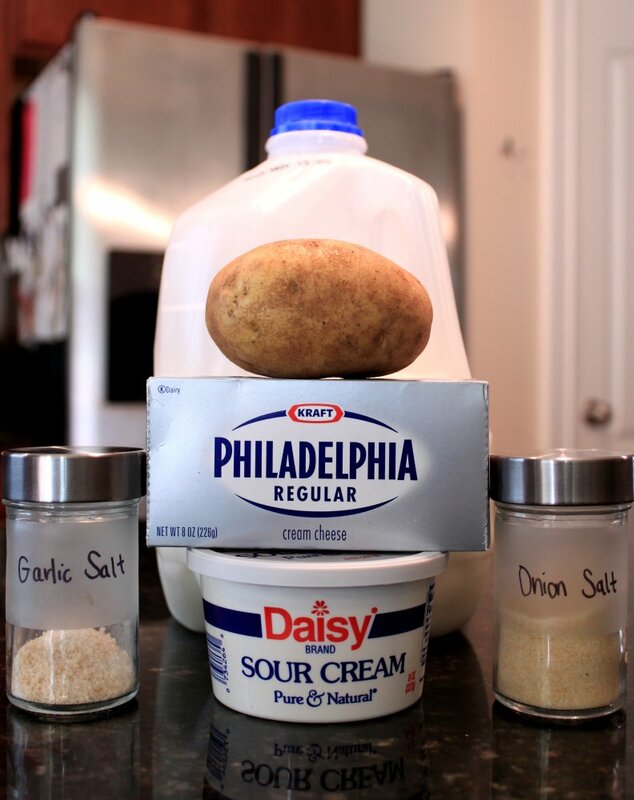 I decided to share a time-saving recipe that I make every year for Thanksgiving. I figure that any recipe that saves me a little time and effort (and kitchen mess) on that day is a keeper. These can even be made up to a few days before your dinner And, if you're wondering - these potatoes reheat just as creamy and light as when you first make them; they actually puff up a little in the oven. They're seriously yum yum yum. There are a few ways to reheat them: You can pull them from your fridge and let them come to room temp on your kitchen counter before popping them into the oven. You can put them straight into the oven cold. You can put them cold in your crockpot on low all day. Or, you can cook them that morning and then keep them warm in your crockpot all day. Seriously, they are about as no-fuss as a dish is going to get on Thanksgiving Day. And if you're like me, and insist on hosting dinner every year, any dish that doesn't require babysitting is worth its weight in gold. Boil potatoes over medium-high heat in a large pot of salted water. Boil until tender, about 15 minutes. 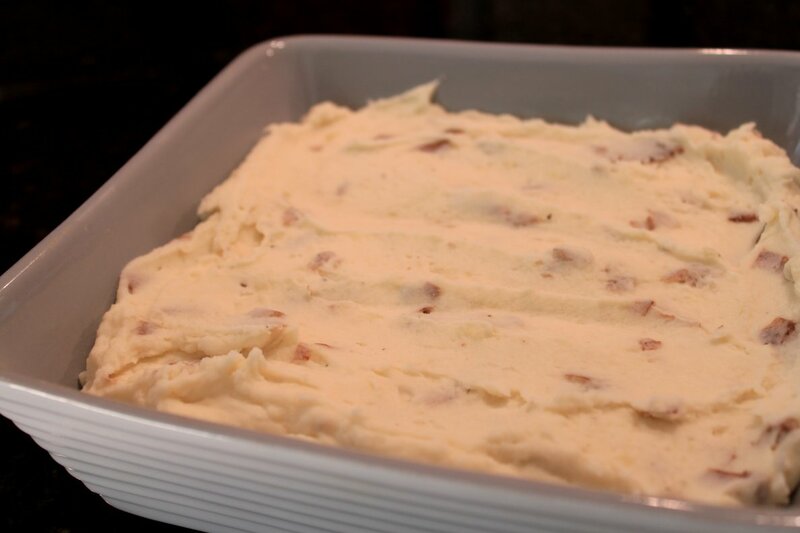 Drain potatoes and mash in a large bowl (either with a mixer or a hand masher). Add in remaining ingredients and mix until smooth. Transfer to a 9x13 casserole dish and cover. Reheat in a 350 degree oven for 30 minutes (longer if they are straight from the fridge), or in a crock pot on low for 5-6 hours.